The River Cottage Diaries: Well Curry My Weevils! I know that the Showaddywaddy encounter was probably the one that you most want to hear about but I really want to find the photo which I'm sure is lurking in one of our many boxes so bear with me while I give you my failsafe recipe for Weevil Curry, a speciality of the Middle East in general and Bahrain in particular. It was The Native's story of the curry cook-off at her local pub that reminded me and, had I had the chance and the odd weevil, I might just have entered myself. What the photo doesn't show is our lovely 'winter' uniform of nylon A-line skirt and fitted jacket in a strange faecal shade of brown. We lovingly called it 'minky brown'. The summer uniform, as modelled by Trish and Susan, was marginally more attractive and, even better, in the presence of a lighted match it could put on a great firework display before melting onto your skin and causing first degree burns. Rumour has it that the airline had approached a famous French fashion designer who produced a design for a new uniform to replace the pyjama suit, as modelled on the right, which was a standing joke among other aircrew in the 70s and 80s, then the airline nicked the design and produced their own budget version madee with more synthetic materials that your average Hollywood starlet, ideal for the hot, humid Middle Eastern climate. But check out the hat in the new(er) uniform. The hat was our signature piece - as well as being a fire hazard. The veil was not quite long enough, or the fabric fine enough, to drape it in a chic manner and the crown was stiffened by a bit of old Cornflakes packet (almost). After a few months it would start to collapse and we would cut up the onboard safety cards and feed them into the crown to make it rigid again. I don't think the management ever quite worked out why the safety cards kept disappearing and it's not as if anyone ever really reads them anyway. The late 1980s were the end of the best years in the Middle East when our tax-free salaries were high and our benefits even better. It was during the Thatcher years when money was king. 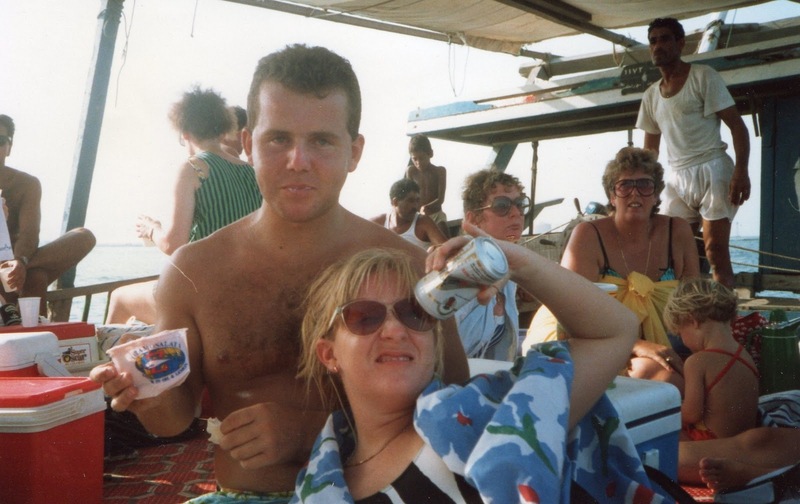 As a 20 year old I was earning more than I could have dreamed of and living a hedonistic existence of speedboats and sunshine, 5 star hotels, lavish parties and foreign travel. Money was no object. Bahrain was a strange sort of place. 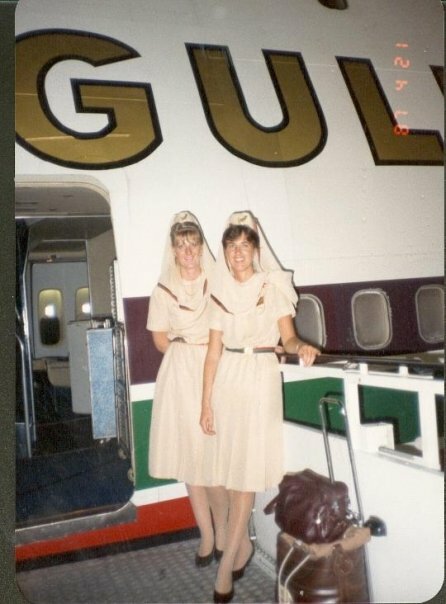 It was the financial centre of the Middle East and home to around 3000 single women under 30 who worked for the airline and a similar number of predominantly young single men who worked for the banks. My four years there were like one long party - well except for the time when I was stuck in Bangladesh for nearly two weeks during anti-government riots. We played Trivial Pursuit so many times that in the end we were giving the answers and guessing the questions. 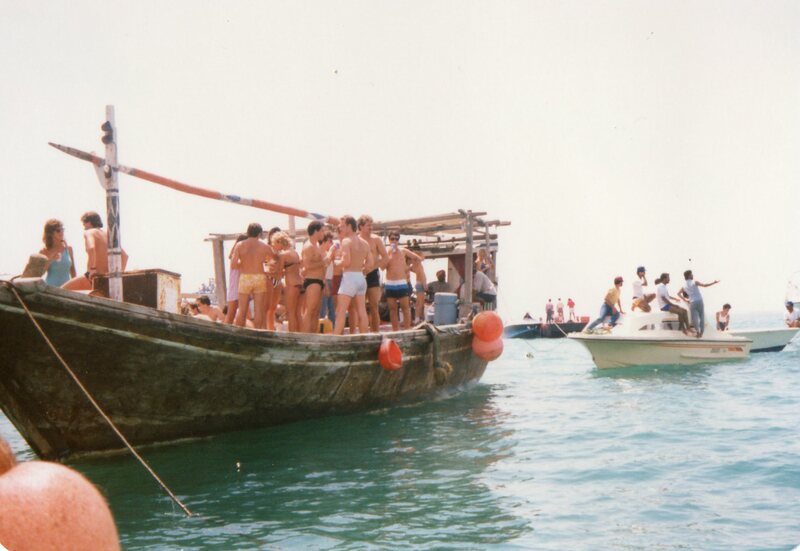 ﻿The weekend was only one and a half days long so we always played hard and one of our favourite pastimes was hiring a fishing dhow and poor unsuspecting crew and sailing out to the islands where we would spend the day water skiing (drinking), (drinking), jet skiing, (drinking) before retiring to the Yacht Club for sundowners. I should point out at this juncture that prior to moving to Bahrain I didn't drink. An unfortunate encounter with a bottle of Martini and a Catholic priest (no, not like that... be quiet at the back!) at a party when I was 16 put me off drink for life, well most of it at least. 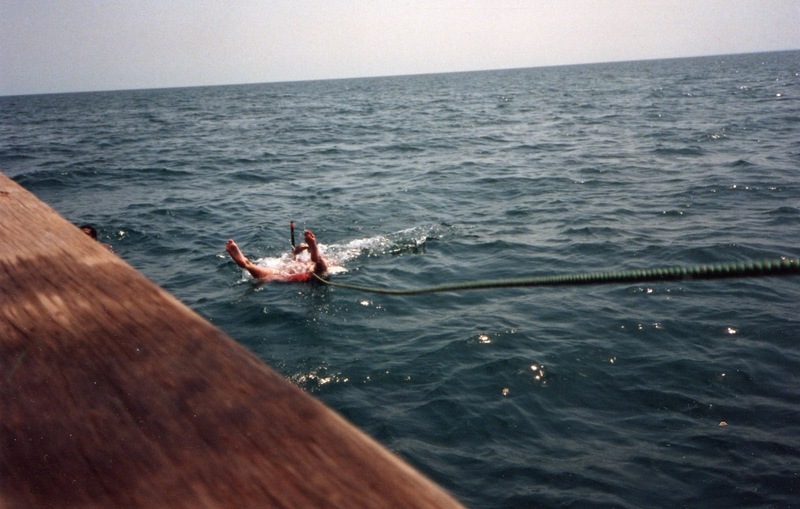 On-board sanitation was basic, consisting as it did of a cabin strapped onto the back of the dhow with a hole in the bottom which emptied straight into the sea. You always made sure to check which way the wind was blowing before you ever used it. Many an unfortunate received an unexpected watering when some newbie had forgotten this important rule. Come Friday, the start of the weekend, we'd load up the Eskies with cold beers, picnics and another local favourite, Drunken Watermelon. Take one large watermelon and slice off the top. Slice up watermelon, eat and get very drunk! Drunken watermelon was an absolute essential to get through the onboard entertainment which usually consisted of some elderly arab gentlemen blowing on the bladder of a sheep (dead) and wailing incoherently while probably secretly plotting jihad against the immoral westerners. On this particular dhow trip, having consumer huge quantities of Drunken Watermelon, I decided to invite my friends back for one of my famous curries. You know how some people get the munchies? Well I get the urge to entertain. Back at our flat, I bumbled around the kitchen in a semi-drunken stupor getting together the necessary ingredients for a marmalade chicken curry, a deliciously fruity affair with lots of err.... fruit, while my houseguests went home to change/sober up/think up a suitable excuse for not returning. ﻿ I chopped up my chicken and marinated it in spices while I peeled some apples. It wasn't easy but I found that if I closed one eye it wasn't quite so hard to focus. A healthy dollop of marmalade was added I put it on the hob to start cooking. After simmering for 10 minutes it was time to add the all-important sultanas. It's an unwritten rule in the Middle East that you never add dried ingredients unless you have checked thoroughly for weevils who, along with the cockroaches, existed solely to make life interesting and usually for all the wrong reasons. On this occasion, mental function being somewhat impaired by rum, I just tipped of good measure of dried fruit into the gently bubbling curry. The sultanas appeared to be moving. I tried shutting the other eye but nothing changed. I took a closer look. The mixture was full of weevils doing the front crawl, the backstroke, even the butterfly. I vaguely thought 'Oh bugger' before the realisation dawned on me that it was the weekend so no shops were open, I had no spare ingredients with which to make another curry and I had about 10 people arriving in half an hour. I scooped the chicken out of the saucepan and rinsed it under the tap to remove the weevils before starting the futile task of trying to scoop out the remaining ones which were now cooking gently in the curry. It soon became apparent that I was completely outnumbered so I took the decision to just stir the rest of them in and have done with it. Without the unwelcome influence of alcohol I would probably have realised that serving up a generous portion of weevils to my friends was a bit anti-social but hey, what you don't know can't harm you... can it? 'Extra protein' I told myself in order to justify my actions. My friends arrived and, with thoughts of the unusual extra ingredient pushed firmly to the back of my mind, the curry was served - to them at least. I told them I wasn't hungry. Well what did you expect me to do? I couldn't knowingly eat weevil curry, could I? As the last person scraped their plate clean the curry was pronounced "the best yet". "Ah, that will be my secret ingredient" I told them, smiling sweetly. To this day, they don't know just what that secret ingredient was. Click on any photo to enlarge it..... if you dare! As a fan of Ray Mears and "wild food" I take my hat off to you. Thanks for the offer of food but... er... I'm on a fast at the moment. Sorry. What a great story! I definitely made the wrong career choice! 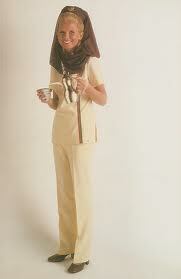 I so want to wear that uniform! Steve, that's what is was, wild food! Actually, I can wait for you to break your fast so don't worry, you won't have to miss out. Talking of breaking fast, I was once invited to an Eid al Adha celebration (the breaking of the fast after Ramadhan). The centrepiece was a mountain of rice with a whole lamb, roasted eyes and all, nestled in the middle as if asleep. Ahhh! Apparently eating the eyes is good for warding off stress caused by working for a Local Authority. Shall I arrange one for you? And Ray Mears... that man didn't get a body like that from eating berries and worms! Auntiegwen, glad it's not just me then! Sarah, are you sure? It could probably be arranged but I'm not sure it's the right thing for downtown Montpellier! You, auntiegwen and me; and no, I wouldn't have eaten it either! Yeah, I suddenly have this urge to start a diet. :) Well that sounded like quite the life you had out there. And dare I say, anytime you get to a point where you decide to go ahead and SERVE the weevil curry, you've probably had a little too much of that drunk watermelon business. MMM, you know they say the average person eats about 4 spiders a year so my weevils would hardly have made a difference. Look at them, they're teeny tiny. Fortunately for all future dinner guests I no longer drink and when entertaining The Husband does the cooking so you are relatively safe. I never did tell. My workmate, Gerard (in the photo) still has no idea that I served him weevils. I've just found him on Facebook. Should I fess up? Looking forward to Weds. Shall I bring some crane fly cookies? Fly, I shudder to think what I may have inadvertently eaten on my travels, particularly in India and South East Asia. Still, I'm none the worse for it. Veggie, I do think that possibly, maybe had I eaten less drunken watermelon (and drunk less beer judging from the photo) the weevils might not have ended up in the curry. Hope you and Fly both enjoy the drunken watermelon but I cannot be held responsible for any food you may either serve up or consume afterwards. Hilarious! Reminds me of the time we drunkenly dropped 8 people's worth of spag bol on the floor as students and just scooped it all up and served it...happy days! CQ, and I bet they loved it too! I remember my mum serving up a joint of beef that our dog had got his teeth into when nobody was looking. See, it's all her fault. Blame the parents I say! Well, they were dead and well cooked by the time they got eaten. I couldn't have knowingly eaten them myself either but I don't blame you for keeping quiet!